Microsoft has released a hotfix KB2750782 to add support for Windows 8-based client computers in System Center Configuration Manager 2007 SP2. Please refer to the following link for more information on this hotfix and how to apply it. How to install KB2750782 HOTfix to SCCM 2007 SP2 Central/Primary Site. 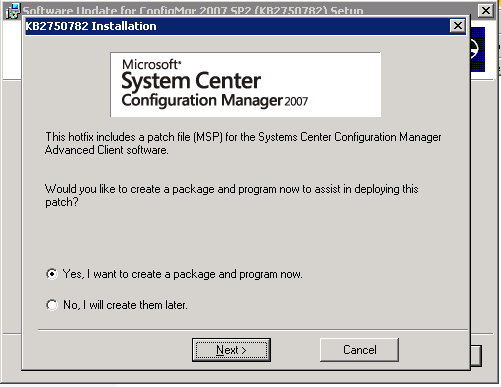 Download the hotfix from here and extract and run "SCCM2007-SP2-KB2750782-ENU.msi". Follow the hotfix wizard to complete the installation. 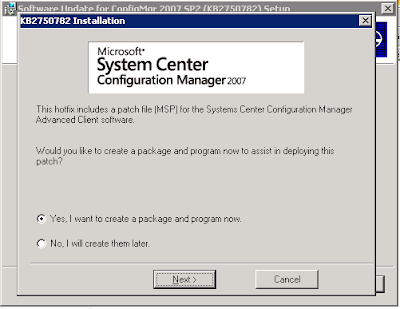 the client hotfix, the MIF file name(SMSAdvancedClient.sccm2007ac-sp2-kb2698619-x86-enu.mif) must be specified in the "MIF file name" field of the Reporting tab. Alternatively, you could use the following product code in the "Name" field. the SMS Agent Host service, it cannot monitor for an exit code from the update and must rely on finding a matching status MIF after the service is restarted. 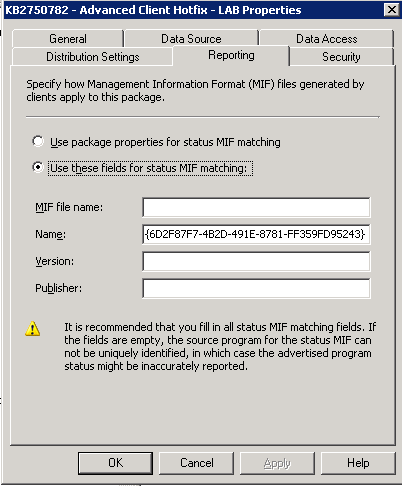 If a matching MIF is not found, the status will be reported to ConfigMgr as a failure (1603) even though the update may have completed successfully. 3. Click "OK" to accept the other default package settings. 4. Under the new package, create a new program. The "Program Properties" dialog box appears. 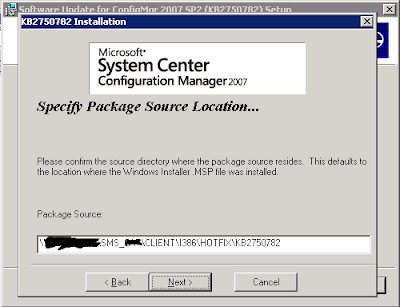 On the "General" tab, in the "Name" box, enter a name that describes it as a hotfix for the Configuration Manager client. SCCM2007AC-<articleID>-<platform>.msp <logfile> is the path where the results should be logged. Specify for the program to run minimized and set the "After running" option to Program restarts computer. 6. In the "Program Properties" dialog box, on the "Requirements" tab, set the "Maximum allowed run time" to 20 minutes. 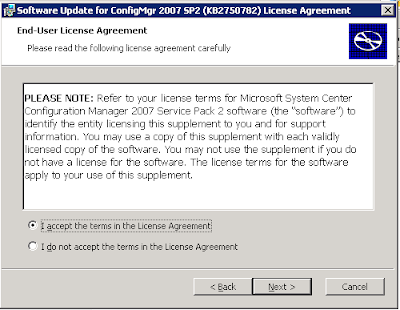 This will prevent the installation from blocking other software distributions if a problem occurs. 7. 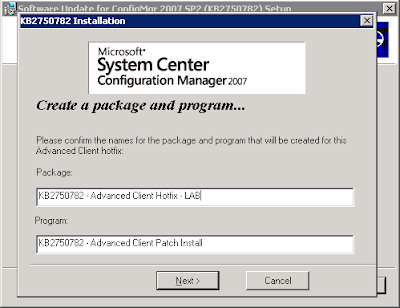 In the "Program Properties" dialog box, on the "Requirements" tab, choose the operating system version on which you want to install the client hotfix. 8. In the "Program Properties" dialog box, on the "Environment" tab, select program can run "Whether or not a user is logged on." 9. Click "OK" to accept the other default program settings. 10. Under the new package, select distribution points for the new package. When you apply the hotfix the component version of some components changes, you can create a dynamic collection based on this data using the above query. 12. 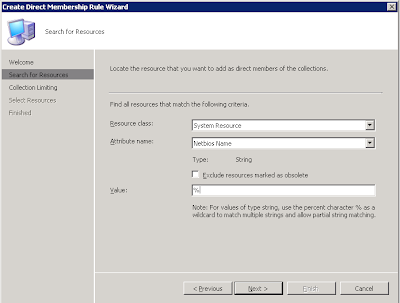 Create a collection based on the query that you created in step 11. Limit this query to a pilot group of systems. 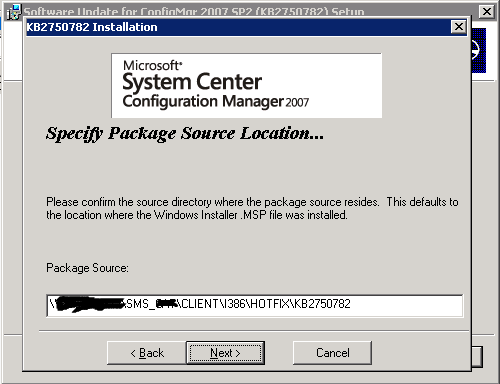 "Name" box, enter a name that describes it as a hotfix for the Configuration Manager client. step 4, and the pilot collection that you created in step 12. 15. In the "Advertisement Properties" dialog box, on the "Schedule" tab, create a new mandatory assignment. Assign it to run more frequently than your hardware inventory collection schedule. For example, if your hardware inventory is collected once per week, use a schedule more frequent than once per week. This will ensure that the hardware inventory that includes the ConfigMgr client version information is up to date. 16. Click "OK" to accept the other default advertisement settings. 17. Test the hotfix deployment to the pilot group. to all the clients that require the hotfix. 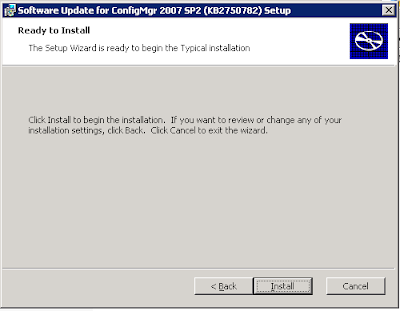 SCCM Client version number changes after you install the hotfix on the SCCM client. The current OS is not supported. 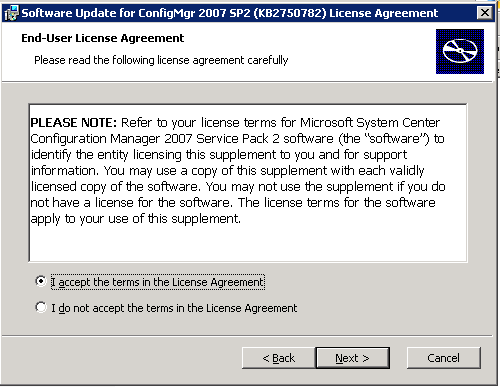 3) Once the service is started, re-attempt the SCCM client installation. 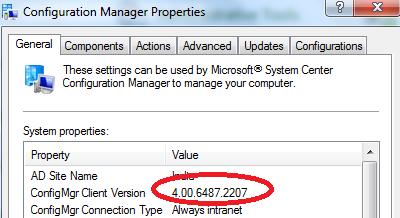 Make sure the SCCM client(SMS Agent Host) service is up and running and the client is working properly. 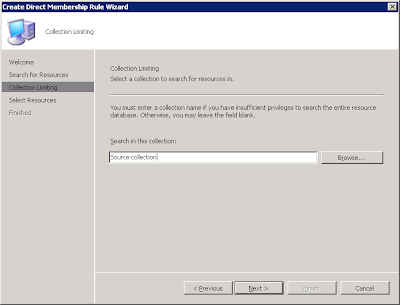 1) Right click on the collection on which you like to add a list of systems that are available in another collection(source collection). Select Properties. 2) Click on Membership Rules tab and click Next. 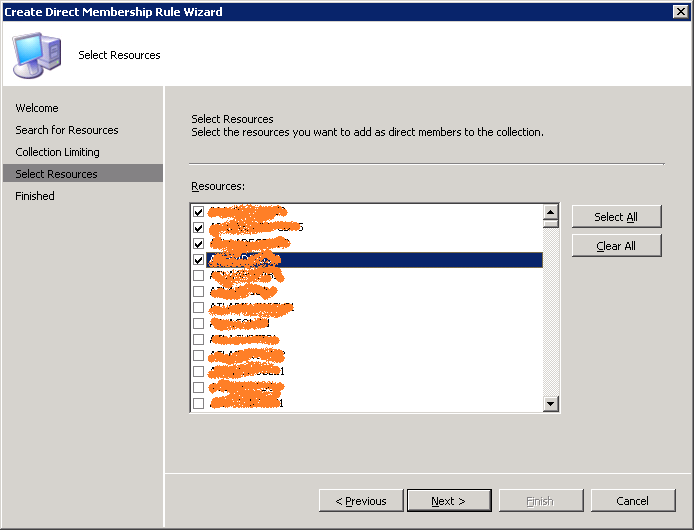 3) Click on Computer icon to start the Create Direct Membership Rule Wizard. 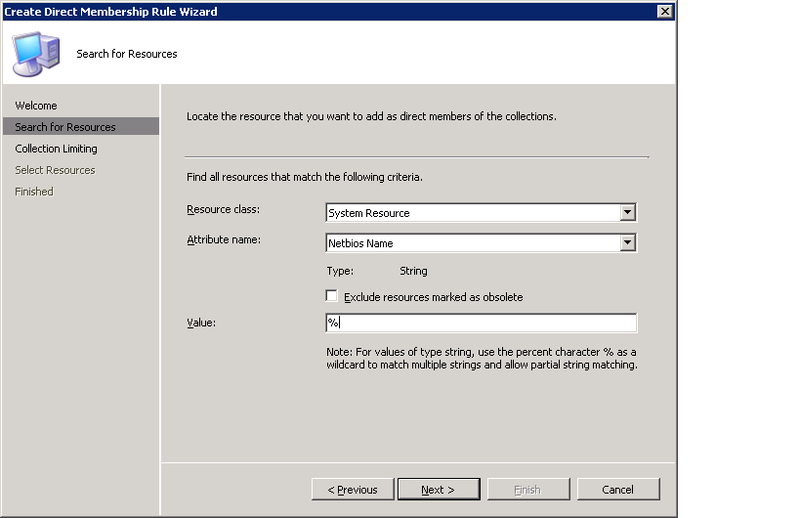 4) In the Search Resources wizard. 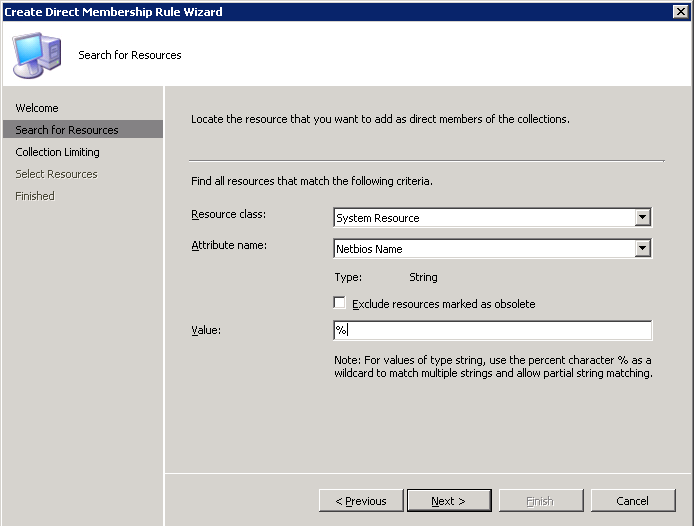 6) In the "Collection Limiting" wizard, in the search in this collection: type the your source collection name and click next. 7) select the required computers and click Next. 8) Follow the wizard to complete it. 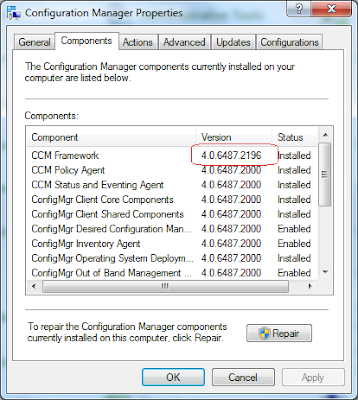 The default reporting in System Center Configuration Manager (SCCM) does not track the Number of Cores and Number of Logical Processors for each processor.The Win32_Processor WMI class contains number of cores (NumberOfCores) and logical processors (NumberOfLogicalProcessors) for each processor. It displays a unique DeviceID for each physical process in the system. This information is only available in newer version of OS's like Vista, Windows 7, Windows 2008, etc. 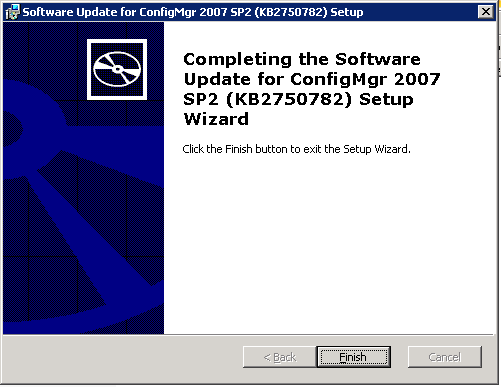 For older version of OS like windows XP and Windows 2003 hotfix are available from Microsoft to populate this information in WMI. The value for NumberOfLogicalProcessors will be higher than the value for NumberOfCores if the processor supports hyperthreading, which effectively splits a core into two logical processors. The challenge is that the reporting on Win32_Processor isn't enabled in the default sms_def.mof. You can look at the information available in Win32_Processor WMI class using the following VB Script. 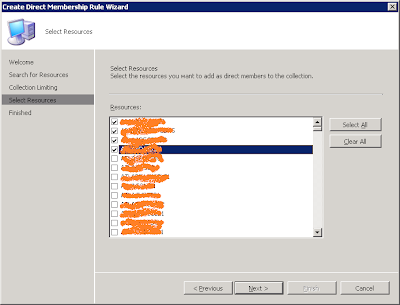 To enable this class reporting in SCCM, the guidelines to update sms_def.mof can be found at this MyITForum post. 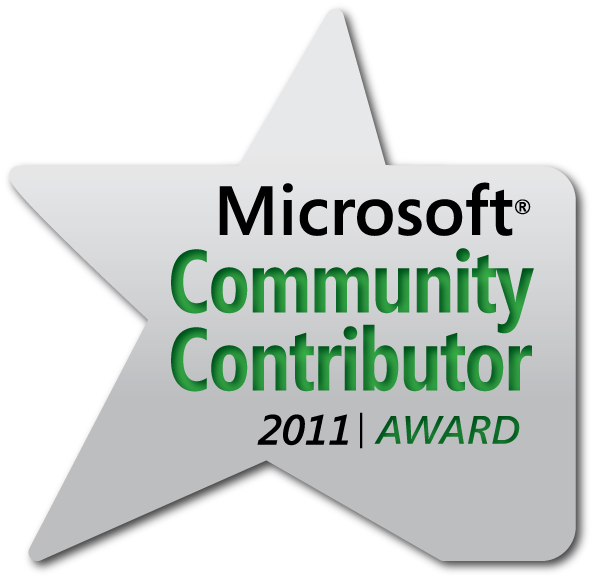 Aditional information about the Win32_Processors call can be found here.